The Mormon church has always been somewhat of a mystery to me, as I think it is a lot of people. My only connection to Mormons was Elizabeth Smart and Mitt Romney. I knew they had to go on missions, or could choose to, but I never knew there were age limits to go that differed for men and women. In the past, these age limits were 19 for men and 21 for women. This article discusses how the decision of the Mormon church is opening doors for women by allowing them to go on missions at 19. It goes on to say that having a family is a top priority of Mormon women and by 21 they are consumed with finding a husband or starting a family and do not want to pull away from that to explore their faith and go on a mission. This step toward allowing women more choices seems to be a fundamental change to the Mormon religion that can benefit women tremendously. By allowing them to go out at a younger age, it opens the door to new opportunities and better life education for women. If they start making this change, will less women want to get married and pursue their own lives? Do you think this will lead to more changes in the Mormon faith? A leukemia patient wishing to take an end-of-life trip to Hawaii ran into significant problems going through security. A TSA agent even went so far as to break open a bag of her saline IV, which she needs to live. This video says TSA followed protocol but the situation is being investigated. Check out Lady Parts Justice online. Liz Winstead talks about how since 2011 there have been hundreds of laws passed that strip away women’s rights to privacy and healthcare. Jerry Sandusky the former widely regarded assistant coach for the Penn State football team was sentenced today by a judge to “no less than 30 years and no more than 60 years.” The conviction was based off of child sexual assault charges. 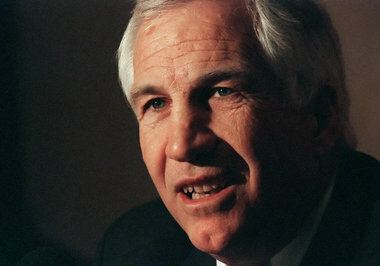 Sandusky’s attorneys have 10 days to appeal the conviction. Have you been following this since it started? What are you thoughts about the sentencing? What do you think about how the University handled this situation? Jessica Stilwell, mother of 3 girls, actually went on strike from her house. For 6 days she did absolutely nothing. I bet you can guess what happened as a result. I know my mom wishes she could do something like that but I know I’ll be keeping this in the back of my memory for when I have kids. Sometimes, you have to lay down the law in a slightly literal sense. This is something that probably wouldn’t be seen in U.S. politics. Prime Minister Julia Gillard calls Tony Abbott a hypocrite and a misogynist for comments he has made throughout his career. It is interesting to watch Abbott and the other peoples reaction to her speech. What do you think of this and what do you think of Abbott’s reaction as the speech goes on?